This pregnancy is flying. Perhaps it me because I feel so good on it – you’ve got to love the second trimester! Here’s some pics of me at 25 weeks. My body is changing rapidly and my tummy is definitely feeling heavier & rounder. That’s the plan I guess! Running hasn’t felt as comfortable this week, so I will try one more time on Saturday and if I’m getting the stitch type pain that I did last weekend, I will swap my running for power-walking. I’m so pleased that I’ve managed to last this long to be honest! I’ve definitely had another growth spurt too; All I’ve wanted to eat are carbs, carbs, carbs! Hard for someone who’s never really been a bit carb eater! This week I’ve decided to go with it BUT obviously tried to stick to whole grains & gluten free options like B Free Foods, who do the most delicious gluten-free, dairy-free wraps, rolls & bagels. If you are in the same situation as me and craving carbs but hate the bloat that comes with them, I’ll be posting some food diaries so you can see what sort of foods I eat throughout the day. other, add the rocket and serve. Fry of chicken and chorizo with a spoon of coconut oil and 1 cloves of garlic. 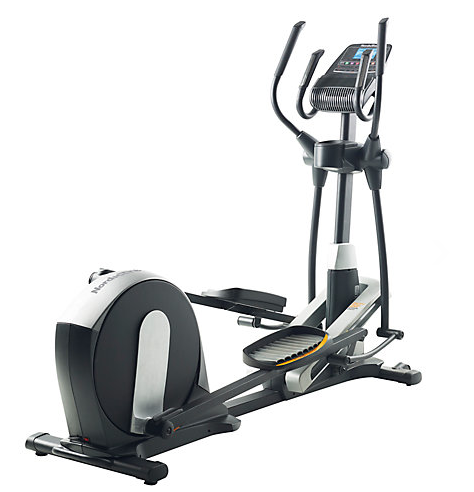 This is where my little beauty, my NordicTrack E11.6 elliptical comes in. I had it delivered last week and it’s in my cabin out in the back garden, which I have made into a gym. It’s really cool in there and perfect for days when me and bump just want to hide away yet still get some exercise in. This morning I was on it for about 40 minutes and did a little routine, which looked like this. I warmed up for 5 minutes, then did 4 minutes on level 3 going forwards. I then had a 30 second rest and repeated the 4 minute interval but with my legs going backwards. I then did 3 minutes in level 5 forwards. I then had a 30 second rest and repeated the 3 minute interval but with my legs going backwards. I then did 2 minutes in level 7 forwards. I then had a 30 second rest and repeated the 2 minute interval but with my legs going backwards. I then did 1 minutes in level 9 forwards. I then had a 30 second rest and repeated the 1 minute interval but with my legs going backwards. I then did 30 seconds in level 11 forwards. I then had a 30 second rest and repeated the 30 second interval but with my legs going backwards. To finish off I just carried on at level 5 at one speed until I had completed my 40 minute stint. To finish the session I did a 30 second plank with a knee dip (static holds tend to push my blood pressure up), then 30 seconds side plank with my arm going from my hip to over my head – again just to keep something moving so I wasn’t in a static position. I did this three times through. Although I do love the gym environment, I really enjoyed my session today and will defiantly be doing this once bubba is born and I’ve had my six-week check up. It’s going to be great to dive down into the gym when I can, knowing that she will be safely in the house with my husband whilst I work towards shifting some of my baby weight! Pregnancy countdown – 42 days to go and I get…. Ever heard of it? I hadn’t either until I did my pre-natal and post natal fitness course with Premier Training International – and it happened to me early this week. 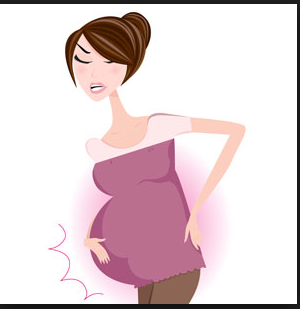 It’s basically one of the most common causes of pain in pregnancy and caused when the ligaments and joints of the pelvis become relaxed due to the hormones of pregnancy (relaxin) and become inflamed by certain movements – in my case like lunges, one-legged exercises, until walking etc. I feel the pain mainly when walking (particularly after I’ve been sitting down for ages), getting out of the car and standing for long periods and if I stand up for too long, so to help it, I’ve totally stopped any lunges or one-legged exercises in the gym, not taking long strides when walking to and from places until I’ve warmed up a bit, and wearing my supportive Gowri Wrap, which gentle supports my baby girl while supporting my lower back. Pulling yourself up when lying on your back. Instead you need to roll to your side and use your hands to push yourself up. Getting up and down from a char with your knees together. When you get up, keep your knees together and use your hands to push yourself up. Avoid soft chairs like sofas, as you won’t get adequate support and they are hard to get out of! Avoid squatting, or sitting cross-legged and sit symmetrically in the chair. Lean on one hip/leg when standing. Instead try putting your weight on both legs rather than on one. Lots of walking or stair climbing. Take the stairs one step at a time. Apparently the pain will eventually subside once the baby is delivered, but to make sure it doesn’t get worse I am going to have acupuncture now every week until I give birth. I swear by it and have missed my weekly sessions during my pregnancy. Research suggests that stretch marks, those small, depressed streaks in the skin that appear mainly around the stomach in the later stages of pregnancy have a lot to do with genetics: If your mother or sister got stretch marks during pregnancy, you’re more likely to get them, too. Other studies show that younger moms, particularly teens, are more prone to getting stretch marks. The key to keeping them at bay is to make sure you don’t pile on the weight too quickly. The recommended amount of weight during pregnancy in most cases, is 25 to 35 pounds. Gaining it slowly may help reduce your chances of getting stretch marks, as will drinking lots of water, which helps keep your skin cells plump and supple. Foods rich in Vitamin E (seeds and spinach), zinc (beef and lamb) and silica (celery), will also help to form collagen, while Vitamin C (oranges, peppers) in particular is an important antioxidant that helps protect tissue from damage, while helping it to form collagen. There are also lots of fantastic creams on the market that are designed to be used day and night to keep the skin hydrated and smooth and help build tensile strength. This restorative moisturiser from fertility and pregnancy guru Zita West contains all natural plant extracts, designed to help keep the skin of your stomach in good condition throughout pregnancy. It’s really rich, smells gorgeous – and is not greasy making it perfect to put on in the morning before you get dressed. 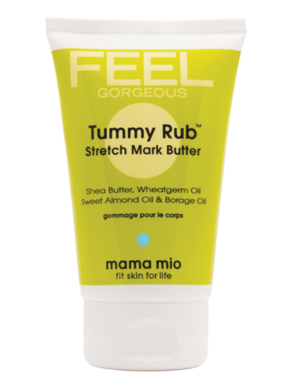 This is great for all over protection from stretch marks as a little goes a long way. It’s made with super-elasticising Omega 3, 6 and 9’s oils to help build your skin’s strength and has a rehydrating shea butter base, making it super thick, and really smooth to apply. 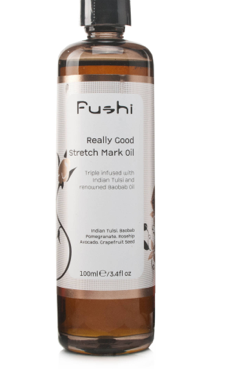 Rubbing anything unnatural on my tummy is a no-no for me, which is why I love this stretch mark oil. It contains Holy Basil, known for its superb skin healing powers and renowned benefits for stretch marks, African Baobab oil, which holds the properties of omega 3, vitamin E and D, and is ideal for scars, blemishes and stretch marks. The oil is a little greasy but keeps my skin hydrated for hours, which is why I like to put it on last thing at night. I thought I would give you a quick update as to how I’m feeling. Saying that – my energy during the day is still good and I’m setting my alarm on my phone to remind me to eat every three hours. Don’t get me wrong, I’m not having a slap up meal every time my alarm sounds but I will head to the kitchen and have a big glass of water and a healthy snack like some avocado on rye bread or hummus or veggie sticks. Sleep – it’s ok. I have one of these amazing pregnancy pillows from Mothercare – which I recommend to EVERYONE! (I even got my husband one because it kept stealing mine!) Sleep is so important for recovery an growth and there is tons of research out there also that says it can help stablise your blood sugar levels and stop you reaching for sugary snacks. There is alot to be said for 8 hours a night – if you can get it!